214 pages | 4 B/W Illus. Kamishibai (paper-theater), a Japanese picture-storytelling medium, is gaining global interest as we move from a text-based culture to one that emphasizes multiple semiotic systems and performance. This is the first volume to explore the potential of kamishibai as a dynamic "new" interactive medium for teaching multimodal communication and shows how synchronizing oral, visual and gestural modes develops students’ awareness of all modes of communication as potential resources in their learning. 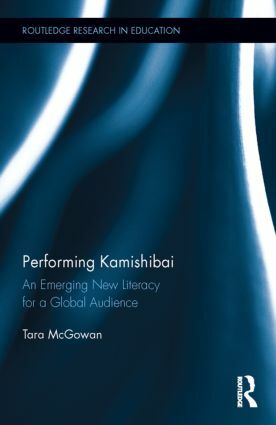 By examining the multiple modes involved in kamishibai through actual student performances over several venues, this volume overturns commonly held expectations about literacy in the classroom and provides a critical perspective on assumptions about other media. It offers much-needed information about a medium that is attracting interest from educators, academics and artists worldwide. Tara McGowan conducts kamishibai workshops in schools, libraries, and museums. In 2010, she published The Kamishibai Classroom: Engaging Multiple Literacies through the Art of ‘Paper Theater.’ Tara earned her PhD in literacy at the University of Pennsylvania and currently works at the American Philosophical Society Museum in Philadelphia.